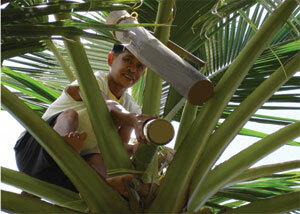 When the coconut tree is tapped it produces a "sap" that exudes from the coconut blossoms. Small batches ensure that our Coconut Aminos, made from this natural sap, is an enzymatically alive product aged and blended with sun dried sea salt, hand gathered from pristine waters near the southern islands of the Philippine coast. It is with a very heavy heart, that we must let you know that a change has been implemented in the processing of our Coconut Aminos product. We have had many issues over the years maintaining a stable end product, due to the naturally occurring beneficial yeast inherent in the raw coconut tree sap, which has a tendency to reactivate after bottling. cost us hundreds of thousands of dollars in recalled product and credits issued. during bottling, and then tipping the bottles upside down for one minute to sterilize the air space between the glass and the cap. Unfortunately this slows down our bottling capacity, but it is the only way that we can stabilize this product without adding any other ingredients, which would affect the delicate flavor profile of this product. There is absolutely no detectable change in the taste, because this process is so quick. We have delayed implementing this for the past couple of years, because of our deep concern for how this change will affect our raw clientele, especially for the raw restaurants and manufacturers who have incorporated this ingredient into their recipes and formulations. Our sincerest gratitude for your kind understanding. We truly appreciate and value our loyal customers who have been supporting our products since the beginning. The principles of tapping the coconut tree blossoms for their sap, bears only minor resemblance to the practice of tapping maple trees for maple syrup production. Containers used to collect the sap are made out of hollow bamboo tubes that are fastened onto the thick fleshy stems covered in small flowers (see photos). The freshly gathered coconut tree sap is oyster white in color, has a nearly neutral pH, and is already inherently sweet tasting by nature. Whereas, the sap from a maple tree (as well as the juice from an agave cactus) has very little readily available sweetness, and requires long heating times in order to produce the sweet syrup you purchase in the bottle. When the coconut tree is tapped, it produces a highly nutrient-rich sap that exudes from the coconut blossoms. This sap is very low glycemic (GI of only 35), and contains a wide range of minerals, vitamin C, broad-spectrum B vitamins, 17 amino acids, and it has a nearly neutral pH. Coconut tree sap produces a multitude of delicious products, including our Coconut Vinegar, Coconut Aminos Seasoning Sauce, Coconut Nectar, and Coconut Crystals, all made through raw methods of either aging the sap for up to 1 year, or evaporating it at low temperature after it is collected. The most remarkable blessing about tapping a coconut tree, is that once it is tapped, it flows its sap continuously for the next 20 years. From a sustainability viewpoint, the harvestable energy production from tapping coconut trees for their sap (which yields 5,000 liters per hectare), rather than allowing them to produce fruit, is 5-7 times higher per hectare than coconut oil production from mature coconuts.